One of the least enjoyable activities for most people is cleaning up around the house. However, if you’re stuck with the unenviable responsibility of tidying things up around the home, there’s a quick and easy way to make things a little easier on yourself. The house cleaning checklist from Microsoft is a great tool no matter how big or small the size of your home is. With the house cleaning checklist, you can ensure that nary a speck of dust will be left behind. In addition, you can save money for cleaning supplies because you can download the Microsoft Excel house cleaning checklist absolutely free by clicking the link on this page! Next to each task is a space to mark when the task has been completed. In addition, there is a space to add notes about each task. There are also pictures in the template accompanying the different categories. 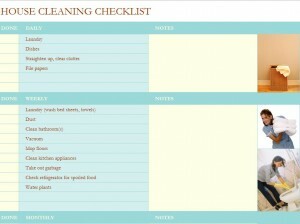 The house cleaning checklist is also great if more than one person is responsible for cleaning and organizing. The Microsoft Excel template is completely customizable, so chores and tasks can be broken up and divvied out before the checklist is printed. The colors, as well as the text font and size, can also be changed if necessary. Cleaning up the home likely isn’t the most exciting part of anyone’s day, but you can be quicker and more efficient with the house cleaning checklist. Download the Microsoft Excel house cleaning checklist and get cleaning today!